A busy lunch hour at the Christine Center Compost Cafe. Come experience mindful presence using practices in yoga and sitting meditation. Yoga poses will be suitable for those experiencing a yoga practice for the first time as well as more experienced yoga practitioners and will be practiced in the Viniyoga tradition. Sitting meditation practices will focus on the role of the breath in finding equanimity and wisdom. Contact Laramee at 612.232.4669 or ljparadise123@yahoo.com before registering through the Christine Center. Cost: Free-will offering, plus meals and lodging. Come and celebrate Holy Thursday, Good Friday and the Vigil of Easter with our Community at the Christine Center. Each day offers group meditation, a presentation on the theme of that day and liturgy of the Eucharist. We conclude on Sunday with an Easter Breakfast and Morning Prayer. If you wish, you are welcome to stay for an Easter dinner at 12:30 pm on Sunday. We are delighted that this retreat is so popular. Call 715.267.7507 to be added to our waiting list. We are accepting applications for a Work Exchange Volunteer to complete outside work such as painting, weed whacking, collecting wood, chopping and stacking wood, and upkeep of our trails. In exchange for 35 hours per week, May-August, you would receive meals and lodging. If interested, please email your request for an application to Marge Zulaski at mzulaski@tds.net. It was a snowy day when I snapped this picture of Johanna a couple of weeks ago. You may be wondering what she is doing. 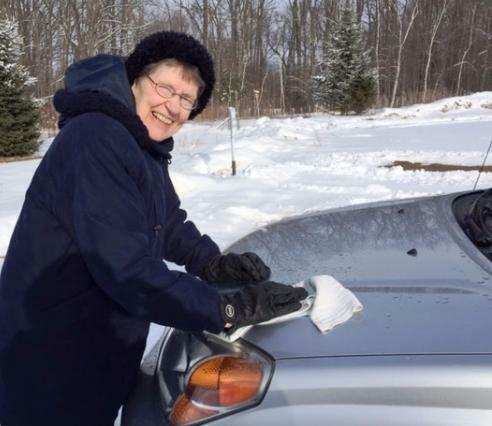 Why is she polishing the hood of this vehicle??? Clue #2: I have seats, but I’m not the Christine Center’s meditation hall. As always, thank you for your enduring support of the Christine Center and its mission. Support Our Mission. Learn how here. Read a Circle of Compassion blog post by Henrita Frost, SSND, a member of the Christine Center Leadership Team. 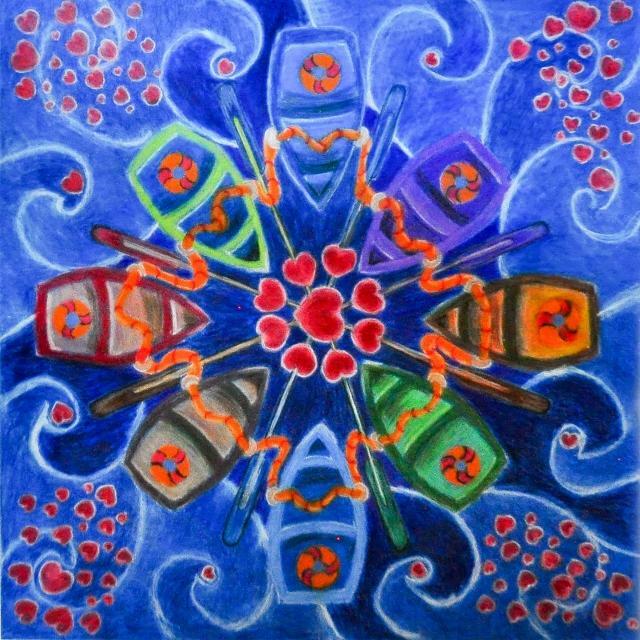 Original Mandala artwork by Henrita in honor of refugees who have died at sea. 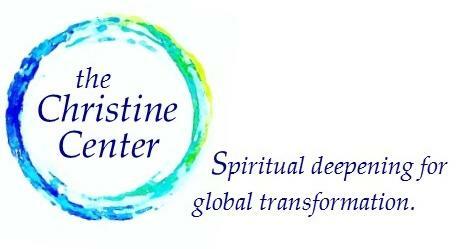 Be inspired by Hildegard’s mystical message of Oneness and share these weekly posts on our Christine Center Facebook page with friends. 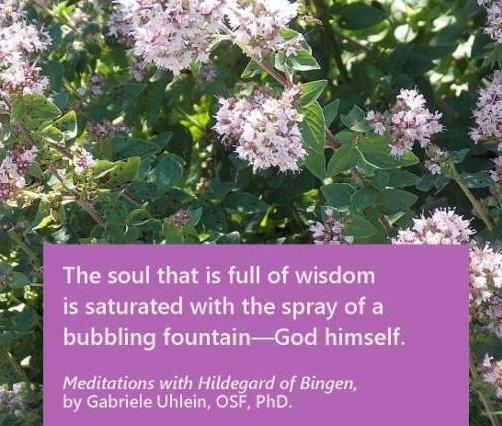 Passages from Meditations with Hildegard of Bingen, by our own Gabriele Uhlein. Images from the beauty of the Christine Center.